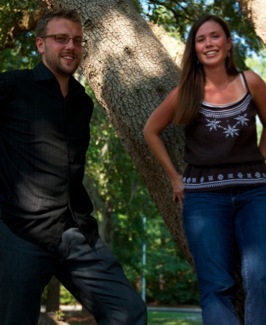 Oh Valentino is an intimate acoustic duo featuring piano, guitar, mandolin, and delicate vocal harmonies. Their warm, understated sound is perfect for your most intimate and romantic events. Expect to hear influences from traditional folk, Americana, indie and contemporary acoustic music. A South Carolina native, Christina has been performing music for over 15 years, including tours of the east coast and New York City. An accomplished vocalist and pianist, Christina has a versatile range of styles from classical to contemporary. A native of England, Aaron has lived in South Carolina for eight years. He has played in bands and duos in Europe and the United States for over 15 years. Pairing his vocals with guitar, mandolin and piano, Aaron incorporates a folk influence into his acoustic performances.